Now all of these different brands have worked (almost) perfectly across both of the machines I have. The very first Cafe Luxe pods I had sometimes didn’t pierce properly and a little bit of water would come out before the coffee, but it didn’t affect the flavour of the coffee. The did an upgrade which seemed to mostly fix the problem, but the pods remain a rather thick plastic container. A few weeks back I had a reader complaining that the Caffe Luxe pods didn’t work at all in his machine. I hadn’t had that problem before and replied as much. I didn’t hear back from the individual. Tonight I heard from another friend that there is definitely a problem. She bought a Nespresso U milk machine. It works quite nicely, makes your coffee then spits the pod out into its little basket without you having to “eject” it. When trying with the Mycoffee pods though, it huffs and puffs and a very little bit of water comes through but no coffee. Then it ejects the pod with no coffee having been produced. On examining the used pod it can be seen that the machine is having trouble piercing the plastic pod and therefore is unable to pump the water through the pod to brew the coffee. A further test with a Foreign Ground pod produced the same result. Now a number of the local manufacturers seem to use the same plastic pods (numbers 1 to 5 on the list above). that somewhat limits your options in terms of which coffee pods you can buy. Caffe Luxe are quite adamant on their website and in their adverts that their pods work on all machines (they even expressly name the newer generation machines), so it seems more tested is going to be needed on their pods. 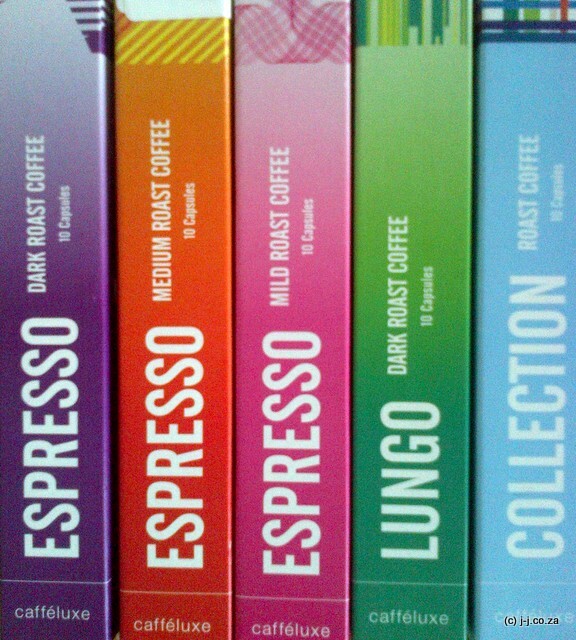 I have tested out some of the newer Caffe Luxe (Option 1) “Origins” range and confirmed they work just fine. The “new compatible” Caffe Luxe capsules seem to work sometimes (but not all). Foreign Ground (Option 5) have introduced two new flavours, which use a new pod design, which work just fine. See post here. Options 6 and 7 seem to be imported (from Italy) and also use plastic pods, but a very different much thinner plastic. Further testing was done and there is no problem here. 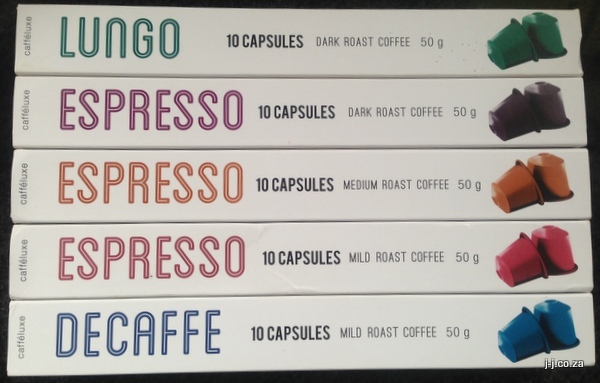 The Caffe Impresso capsules have a series of small holes pre-pressed into the back of the capsules. Water flows through here a little slowly at times if further holes aren’t punctured but this doesn’t affect the final outcome of a great cup of coffee. This is incompatibility of “compatible” capsules is bit of a pain as one of the benefits of using the Nespresso system over some of the others was that there seemed to be a growing range of alternate (and cheaper) pods that could buy for daily use. If you have come across other sources of compatible pods, and have any further test results as to which machines they may work in please do share your experiences. After one of our readers complained about the Caffelux capsules, the good folk over at luxurycoffee.co.za stepped in and offered to send her some capsules. At the same time they noticed my previous blog post on their coffee still showed the old branding and product. Since the product had been updated with new branding, capsules design improvements and coffee they very kindly offered to send me some of the new coffee to try, which I gladly accepted. Below you can see the new whiter, lighter branded boxes of the five flavours. Excuse the poor quality of the picture, the Blackberry camera isn’t really suited to taking closeups of small newspaper adverts. This afternoon I saw in our local community newspaper (Highway Mail – 8 June 2012) that Hirsch’s were advertising “Fits into a Nespresso” coffee pods. 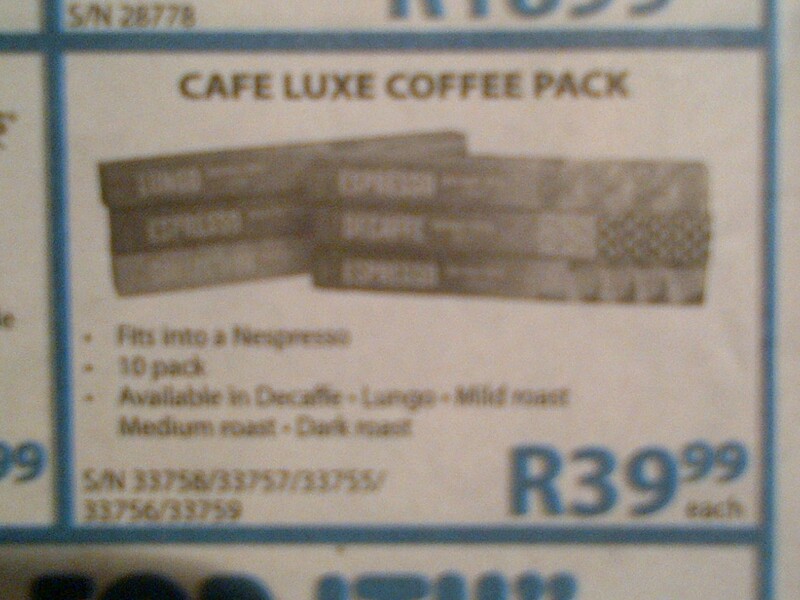 Branded as “Cafe Luxe coffee pack” they come in sleeves of 10 capsules. Priced at R39.99 its about a rand per cup cheaper than the original nespresso. Not sure if it’s worth the difference but I haven’t tried them so shouldn’t comment on the quality. I am intrigued. If anyone has bought or tried this coffee please let us know. I see that the online Espresso Shop also stocks these capsules. They have pictures of the capsules, also priced at R40/pack of 10, along with an FAQ stating that these are fully compatible and won’t damage your Nespresso machine. More details at their website here. The capsules are in rather colourful, but plain and function box. I tried the medum roast blend (the orange box), and it was ok-ish. Perhaps slightly bitter, but nothing special. Neither good nor bad. After just one cup my initial thought is that I probably won’t buy these again. For saving R1/cup it isn’t worth it, especially with the niggles above. Still, have 49 more cups to go, so more feedback to come.